I would like to share some ideas regarding our local food production here in Northern Indiana. When I think “local”, I am usually visualizing Elkhart County, but these ideas can be considered for all of Michiana. 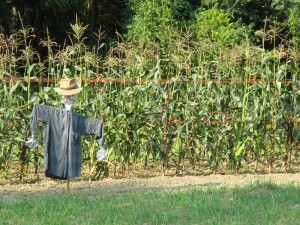 Northern Indiana is a great place to garden or farm. We have good soils and a climate suitable for growing a wide variety of the foods we regularly consume in our daily diets. What astonishes me is not so much what could be grown in our region, but rather what we don’t grow. While we do have some crops like sweet corn, strawberries, potatoes, etc. and certain processed foods, like cheese, represented fairly well, others, like dry beans, are nearly non-existent. I am no expert in conventional modern agriculture, and it is not my place to overly criticize farmers in my region. I respect the majority of growers in our region, both conventional and alternative. Farming is hard work regardless of personal philosophy. What I do know is that when I travel across my county in the summer and see the thousands of acres of corn and soybeans, I am acutely aware that very little of these crops stay in our area as consumable human food. Some may wind up as local animal feed but I suspect that most is shipped out of our area and becomes a “commodity” to be fed into a vast global chain producing vegetable oil, corn syrup, animal feed for industrial feed-lots, and other residual byproducts. I am not neglecting the fact that there are some farmers in our region who have ventured into more diverse crop choices, but these amount to a tiny fraction of what is actually consumed here. My purpose in writing this is simply to place on the table some “what if” scenarios. I will leave logistics and marketing out of these “what if” scenarios and assume there are individuals far better equipped to deal with these issues than I am. This is simply a starting point for discussion. I realize the distance between conceptual to reality can be a long haul. My “what if” scenarios may quite possibly be unfeasible, given certain constraints I have not considered, yet I believe it is always a worthwhile exercise to think “outside the box”. There is a booming, small-scale, sustainable Ag movement emerging in our area. It has been in the works for a long time and steadily growing each season. The idea of purchasing local beef by the quarter or half has been around since I was a kid. What is new is the growing number of grass-fed, organic, and sustainable beef growers in our area who are focusing on the local markets. Some of these operations are diversifying to also include poultry, eggs, pork, and other products, along with their beef. There is an ever increasing number of CSA’s and truck-patch growers providing fresh, seasonable produce for our tables. High house operations are closing the season gap and providing us with crops like tomatoes and greens deeper into winter and earlier in the spring. There are many other examples of new local agricultural products coming on line, but I want to consider the glaring lack of staple crops like beans and grains for starters. A quick look in your cupboard will size up the importance that grains and legumes play in our diet. Whether you weekly consume artisanal bread and homemade granola or love to munch on a bag of nacho chips and black bean dip, staple crops are essential in our diets. My “what if” scenarios are about the possibility of raising more of these crops for our local markets, as well as raising them in our backyards along side the tomatoes and sweetcorn. For this mind experiment, I will briefly lay out some projections for five specific crop varieties: Shininome soybeans, Painted Mountain corn, Christmas lima beans, Dale sorghum, and Tennessee Red Valencia peanuts. I am using my own yield data to make these projections. I farm organically and use a tractor and tiller for field prep only. Planting and harvest for each of these crops is done manually, as well as post-harvest procedures such as threshing and winnowing. This adds a lot of variables for the “true” costs associated with these crops, but again, this is only food for thought. I have grown each of these crops successfully and found them to be a high quality food product in their finished state. In other words, they looked great and tasted great. Another consideration is that they are all open-pollinated varieties and have produced viable seed with high germination rates for repeated plantings. *yield projections are based on 1/8th acre plantings (5445 sq. ft.). My initial data comes from plantings on my farm ranging from 500 sq. ft. to 1000 sq. ft. The projected yields assume for 3′ row spacing for row crops, and in the case of crops grown in beds; a 4′ width for the bed and 3′ spacing between beds. Shinonome Soybeans Soybeans for the most part have been an overlooked food crop in America with the exception of its use as a source for vegetable oil, food additives, and animal feed. Soybeans are very high in protein and can be cooked to make soups and other tasty dishes like ” Swedish baked soybeans”. While I am by no means a vegetarian, I do find soybeans a fascinating crop with their versatility for value added processing to make soymilk, tofu, miso, and tempeh, etc.. Miso and tempeh are quite involved in their production, but soymilk and tofu are quite easy to make at home. My wife and I use a Soyabella soymilk machine and can produce 1 quart of fresh soymilk in about 20 minutes from our own presoaked (6hr) beans. The byproduct of this process, okara, is a high protein food that can be used in baked goods, stirfrys, and numerous other recipes. In the tofu industry, okara is generally sold to be used as an animal feed ingredient. 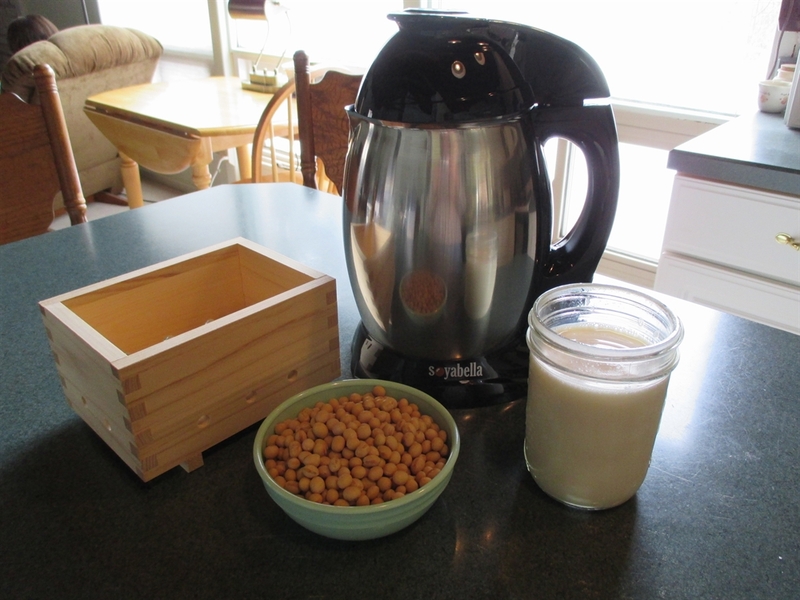 The fresh soymilk can then be processed easily into tofu in about 20 additional minutes. 1/8th acre of shinonome can yield 376 lbs of dry, unshelled beans. Those beans can be processed into 471 gallons of soymilk with a large amount of okara (200+ lbs) as an additional food byproduct. The soymilk could then be used to make 188 lbs of tofu. *One pound of soybeans = 1,887 calories and 154.7 grams of protein. 1/8th acre would be 709,512 calories and 129.8 lbs of protein. Painted Mountain Corn This early variety is not nearly as high-yielding as modern hybrid corn varieties, but it excels for being adaptable to various extreme weather and climate conditions. It is an open-pollinated cross of over 80 varieties of Native American corn. 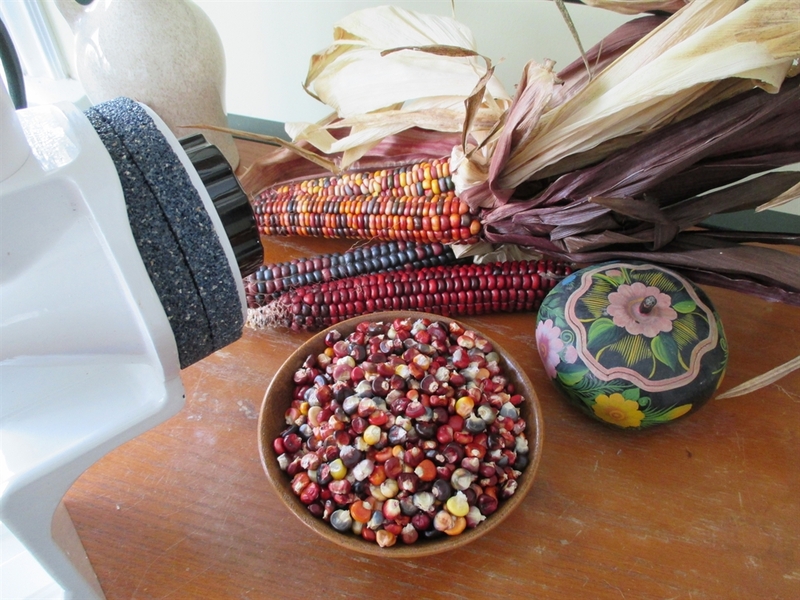 The multi-colored kernels are rich in anti-oxidants. It can be eaten in the fresh stage (dried, boiled, or roasted) or the dry corn can be ground to make an excellent nutritious flour or meal. 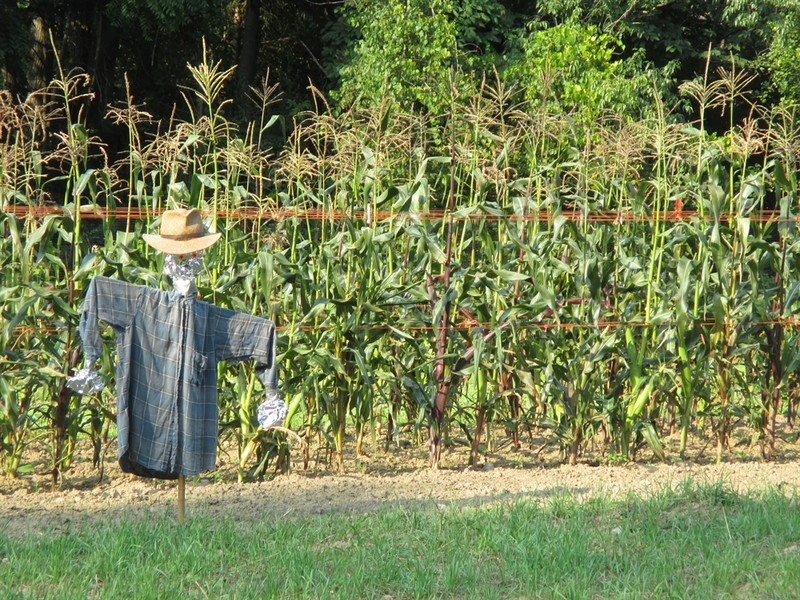 1/8th acre can yield 283 lbs of shelled, dried corn. You could probably double or even triple that yield by growing it in beds with closer spacing than the traditional 2′-3′ row crop spacing. I plant mine in rows spaced 3′ apart. * One pound of shelled corn = 1,656 calories and 40.4 grams of protein. 1/8th acre would be 468,648 calories and 25.52 lbs of protein. Tennessee Red Valencia Peanuts Growing peanuts in Northern Indiana has always been a fascinating prospect for me. While my yields have not yet come close to what you would get in the south, I still find peanuts to be an important part of my seasonal crop lineup. This is partly due to the fact that peanuts, like soybeans, have such a diversity of uses. They can be used fresh, or dried and roasted. You can of course make fantastic home-made peanut butter. The shells are a great addition to the compost pile or used as mulch. An important goal for me has been to find an easy crop that could be pressed for making a high quality, healthy cooking oil here in our area. 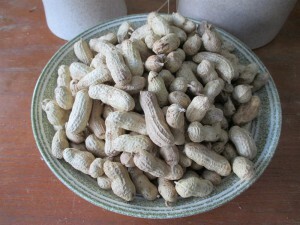 Peanuts have proven to be much easier to grow and process than sunflowers, oil seed radish or tree nuts. 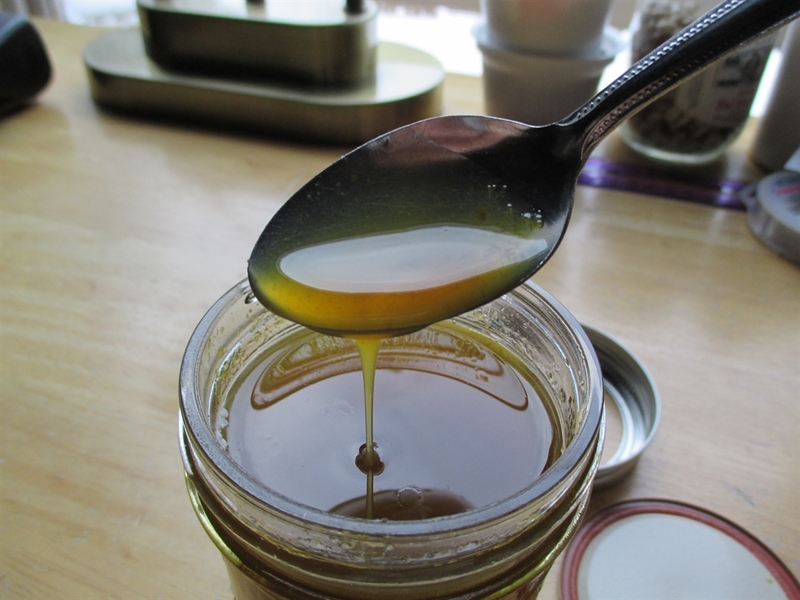 In addition, the “press cake” leftover after extracting the oil is a nutritious byproduct for baking with, adding to smoothies or soups and other numerous possibilities. I will not even attempt to cover George Washington Carver’s 300+ uses for the peanut. 1/8th acre of Tennessee Red’s can yield, very conservatively, 210 lbs of peanuts. Given that 27% of the weight is in the shell that would equate to 56.7 lbs of shells and 153.3 lbs of unhulled peanuts. One pound of peanuts can be pressed to extract approx. 1/2 pint of oil. I use a Piteba hand-crank oil press. For larger amounts than this, there are small scale, industrial presses available, as well as other peanut-specific equipment. From 153.3 pounds of peanuts you could extract close to 9 1/2 gallons of your own premium, organic peanut oil. * One pound of shelled peanuts = 2,572 calories and 117.9 grams of protein. 1/8th acre would be 394,287 calories and 40.34 lbs of protein. Christmas Lima Beans This last season was the first time I have ever grown lima beans. I must confess this was no mistake, since, as a child I spent more than a few evenings at the dinner table, alone, staring at a plate of cold lima beans. Forty years later, I gathered my courage and grew a 33′ trellised row to harvest as dry beans. I was extremely impressed, not only with their flavor but also the yield and quality. From that single row (100 sq. ft.) I harvested nearly 15 lbs of dry beans. By comparison, a 30 row of pinto beans yielded 6.7 lbs. Of course any trellised “vertical” crop of beans is going to out-produce a comparable bush variety. 1/8th acre of Christmas lima beans should yield somewhere around 810 lbs. of dry, shelled beans. 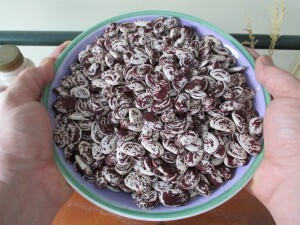 Of all the varieties of dry beans I have grown, lima beans have been some of the easiest to remove from the pods. *One pound of dry lima beans = 1,533 calories and 92.5 grams of protein. 1/8th acre of lima beans would be 1,241,730 calories and 167 lbs. of protein. Dale Sorghum Sorghum is a crop that is grown in our area and sold as sorghum syrup in local stores, although I know of only one farm in Shipshewana doing so. Dale is a variety that is excellent for pressing the juice to make a rich, sweet syrup, but also produces a good quality grain for human consumption and/or animal feed. Chickens love this stuff. Sorghum is also a good source of biomass for the compost pile and/or forage for animals. I have been growing Dale for 4 years now and have always gotten a reliable seed crop even though it is fairly long season (110 days). The amazing thing about sorghum is the grain yield vs other grains. My experience has been that a 100 sq. ft. bed can produce nearly 16 lbs. of grain. That is more than double compared to my corn, and wheat yields. 16 lbs. of grain per 100 sq. ft. would translate to 864 lbs. grain from 1/8th acre. The only comparable contender would be milo (a type of grain sorghum not suitable for syrup), with potential yields of 1,181 lbs. per 1/8th acre. The same cropping of Dale that yielded 864# of grain can also be pressed (extracting the juice from the stalks) and boiled down to produce an additional 27 gallons (or slightly more) of finished sorghum syrup. After extracting the syrup and harvesting the grain you are left with 2,720 lbs. of dry biomass for compost or forage. Aside from the above mentioned you could add to this list, Pinto beans, black beans, and numerous other types of heirloom dry beans. Also for consideration would be oats, barley, millet, quinoa, teff, amaranth, and possibly rice! Of course we could always use more local sources for rye, buckwheat, and wheat. This is food for thought as we take inventory of our local food shed and envision where it should be in 5, 10, or 15 years from now. This entry was posted in Grains, Legumes, Peanuts, Uncategorized and tagged Food Shed, GRAINS, LEGUMES, Northern Indiana Seed, Peanuts, Staple Crops, Tennessee Red Valencia Peanut. Bookmark the permalink.